There are many ways to hold a lute. 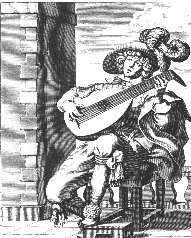 In old paintings and engravings you can see a broad variety of lutenists in various playing postions. Your choice for a particular position will depend on your body size, the size of your lute, and your personal aesthetic preferences. Whatever your choice, two considerations must remain paramount: Your playing position should provide the maximum possible body relaxation; and the left (fingerboard) arm and hand should not be involved in securing the instrument's position. 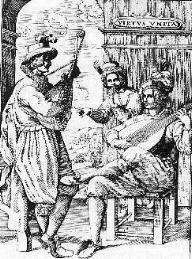 When you sit with an upright posture towards the front of a chair, the lute will touch your body in three places. The first place is your thigh; the second place is your chest and stomach; the third place is your right underarm. Your left arm initially hangs relaxed along side your body. A piece of leather on your thigh can prevent the lute from slipping out of position.